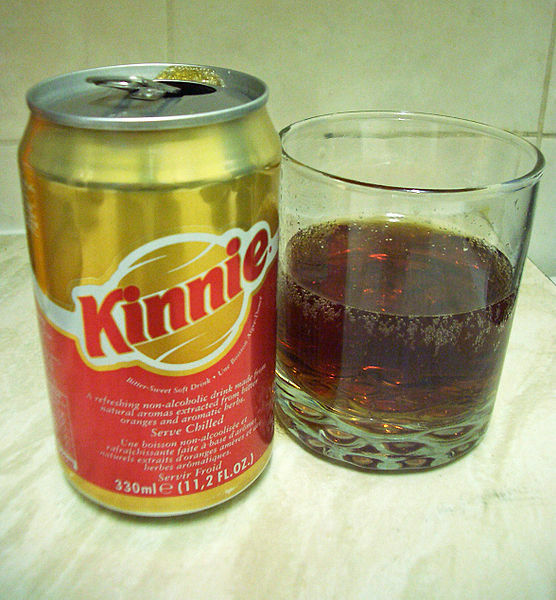 Kinnie is a soft drink that originates from the Mediterranean island of Malta. It was first developed in 1952 by Simonds Farsons Cisk. Kinnie has a bitter sweet flavour and looks and tastes like an Italian style alcoholic aperitif. It is drunk straight, or mixed with alcohol to create a long drink. Left: A can and glass of Kinnie. Kinnie's distinctive amber colour makes it look similar to cognac. It is difficult to describe the taste of such a beverage, however it is sometimes referred to as a sparkling, non-alcoholic hybrid version of Jaegermeister and Campari. The original and innovative taste of the product resulted in Kinnie being awarded the prestigious L'épi d'Or de la Qualité Internationale by the internationally renowned Paris institution, Comité International d'Action Gastronomique et Touristique. According to the Kinnie website, the beverage can be imbibed in many ways. It is most often served with ice and a twist of orange, but sometimes mixed with popular spirits. Kinnie’s bitter-sweet taste lends itself well to mixing and enhances the flavour of most alcoholic drinks such as vodka, whisky, rum and wine among others. It can also be used as a top-up in a various cocktails. Vodka with a Kinnie base is known as a 'Maltese passport'. When Russian Standard vodka is used, the drink is sometimes called a Siberian beach. Kinnie's recipe is a tightly kept secret. However the official website provides further information about its ingredients, suggesting that Kinnie owes its unique bitter-sweet taste to the blend Maltese Mediterranean chinotto bitter oranges, combined with an infusion from a dozen different aromatic herbs and spices such as anise, ginseng, vanilla, rhubarb and liquorice. Only natural ingredients are used. Over the years, Kinnie has made inroads in various countries, due no doubt to the millions of tourists from Europe that have visited the Mediterranean island of Malta.